The Fed chairman’s comments, Janet Yellen, concerning the weak Non-Farms and the less new job opportunity affected EURUSD. Moreover, the US is publishing Nonfarm Productivity and Unit Labor Costs. After yesterday’s growth to 1.13940 and almost getting close to the 61.8 of Fibonacci retracement, it is time for a reversal pattern. 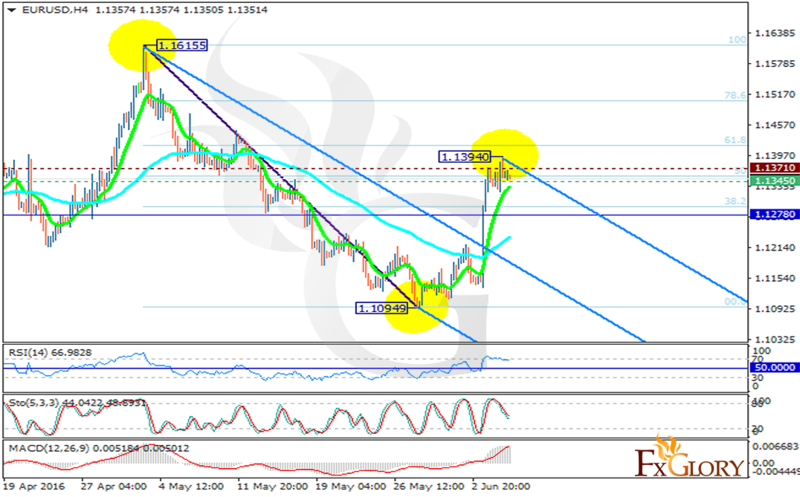 The support lies at 1.13450 with resistance at 1.13710 which both lines are above the weekly pivot point at 1.12780. The EMA of 10 rallied upward crossing the EMA of 75 yesterday and now it is creating a curve waiting for the price movements. The MACD indicator is in positive territory and the RSI is located in overbought zone so both are signaling price growth; however, the Stochastic is showing downward momentum suggesting the price decline within Andrews’ pitchfork. We will stay bearish for this pair targeting 1.1300.